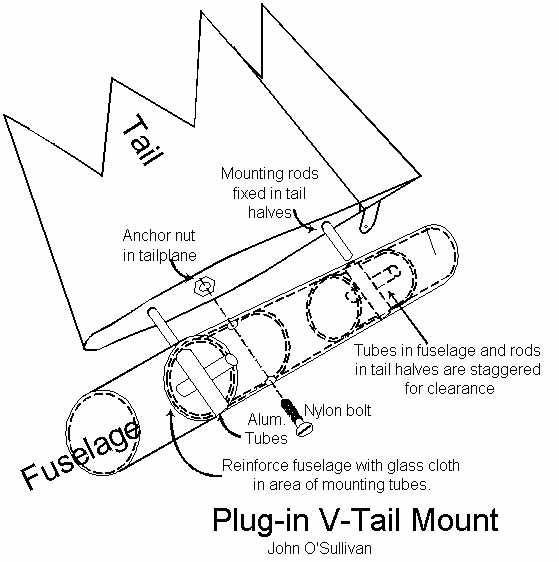 Fixed V-Tails are awkward to transport and are susceptible to hangar rash. One piece removable tails are still difficult to pack compactly. The answer is in using individually removable tail halves. I have been using the following system for the past eight years. My fuselage tailbooms are circular at the tail end. I mould them overlength and use the cut-offs as reinforcing inserts inside the fuselage. If this is not possible, reinforce the mount areas with glass cloth. The diagram below should be reasonably clear on the set-up. Make sure there will be clearance between the mounting tubes and control pushrods Make a jig to ensure that the mounting holes can be drilled precisely at the correct angles (e.g.. 110 deg.). Once the holes are drilled, it is hard to change alignment. I set up my tails at 0 deg. incidence relative to the fuselage axis. This is easier than trying to accurately calculate offsets for drilling for other incidence angles. I use pylon mounted wings and adjust decalage in the pylon as needed. Tail mounting rods are built into the tail halves. For HLG and lightweight soarers, I use 1/16" music wire. For 2 metre and 60" slope racers, use 3/32" wire. Open and FAI models 1/8" or 3/16" rods. Mounting tubes are offset to allow overlapping of the tubes. 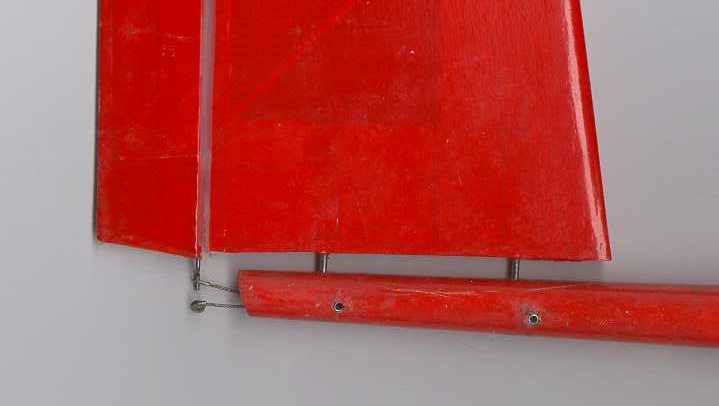 This also means that the rods in the tail halves have to have the corresponding offset! Lighter models such as HLG and lightweight 2M models can dispense with the nylon locking bolt and strips of tape on top and below the tail will hold well. With larger models, mount nuts in the tail halves and lock with a suitable sized bolt through the fuselage. On heavier duty installations, an aluminium tube through the fuselage is recommended to prevent damage. With slimmer fuselages, there is a possibility that the cross tubes will occupy a major proportion of the available space within the fuselage. This leaves very little room for the pushrods. Keep this in mind when setting up your system. So far, I have used this mounting on about half a dozen models of various sizes and have had no problems. Next problem is to figure out how to get a workable system for full flying stab V-tail!